Name a board strategy game that has more technical complexity than Chess? This same game usually takes less than one hour to learn and a lifetime to master. Unlike the game of Chess, the top masters of this game have not been defeated by a computer. This game was developed in ancient China and refined in Japan. It is called WeiQi in Chinese or more popularly known by the Japanese word Go. The literal meaning is to surround. (As a side note, Go is called Baduk in Korea.) For this article, the term Go will be used to describe this mysterious but ancient Asian board strategy game. Historically, Go was considered one of the four great accomplishments of ancient China, one of the worthy pursuits of a lifetime, along with poetry, archery, and calligraphy. It is both an art and a mental exercise - ingeniously disguised as a game. People of all ages can play and enjoy Go, from children of five or six to people in their nineties. Not only was Go popular with royalty, it was also a favorite exercise for warriors, scholars and philosophers. The object of this game is simple: control the greatest quantity of territory by surrounding your opponent's stones in a 19 x 19 gridded board with the minimal amount of pieces. Stones are placed on any of the three hundred sixty-one intersections. To some enthusiasts of Go, there is a philosophical bent to it. As in martial arts, a player's Go game is an extension of their view of life. Go originated in China about 4000 years ago. Japan imported the game of Go around the eighth century. Players in eastern Asia have excelled at this game throughout modern times. Go reached the western hemisphere in the late 1800s. Completely logical in design, the game of Go has withstood the test of time. Today Go survives in its original form as the oldest game in the world. It has been said that there are over 100 million devotees of this game. Asian Go masters considered the Go board to be a microcosm of the universe - an extremely complex and chaotic universe. In their eyes, an empty game board is a visual paradigm of simplicity and order. In fact, the possibilities of game play are endless. The ancient Go masters has said that Go games are just like snowflakes  no two games are alike. A typical game of Go starts with two players and an empty game board. Players would alternate putting black and white stones on the board to surround an area or territory. Whoever has more territory at the end of the game is the winner. There are nineteen horizontal and nineteen vertical game lines on the standard board,which forms a grid of 361 intersections or "points." The winner is always the player who has accomplished these goals more efficiently. The goal is to make the opponent to say, "‘I pass," meaning there is no way of achieving any of the above goals. The game is then over. Passing presumes that all claimed territories are completely surrounded (all fence sections are in place) and no stones are in atari (a position to be captured) along the borders between opposing live groups. To win in Go, all you have do to control a minimum of 181 points of the board. Sound simple? 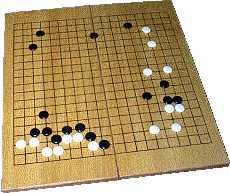 It has been said that Go is a game that takes a minimum of nine minutes to learn and nine years to win. In reality, it usually takes a lifetime to master. After hundred of games, one gains the experience that spending too much time looking at the small-scale tactical side of a confrontation can cause one to miss the large picture and as a consequence, lose badly. On the other hand, if one sets up patterns of safety or executes attacks without caring to examine and adapt to the changing situation, the other player can prevail. In both cases it becomes difficult to win. The consummate Go players are those who don't waste a move or a resource. Every move that is executed should serve a small but continuous move toward the long-term objective of the player. It has been said that the three attributes of a consummate Go player are patience, persistence and the ability to adapt to any game situations. While Go is a simple game to learn, with its endless permutations it is almost impossible to master. Currently, the brute force of computers like Deep Blue, which can rapidly explore the possible outcomes of a game and choose the best course of action, is overwhelming chess masters. This "brute force" approach is not applicable to Go. For one thing, brute force depends on the ability to perform a quick, accurate positional analysis, but it is qualitatively more difficult to evaluate a "Go" position than a "Chess" position. To succeed in the game of Go, deep analysis is often required just to decide which strategic position favors one side or the other. A single mistake in this analysis could fatally throw off a computer evaluation. As a result, Go is a much more interesting computing problem than Chess. Go programmers must try to replace exhaustive search with expert knowledge, as human players do. They must approximate human perception judgment and reasoning. So far there has been little success: the best Go computers today play at the level of an experienced beginner. Before a Go game starts, the board is empty, whereas in Chess the game board is full of pieces. In a game of Chess, from the start to finish pieces are usually exchanged and positions are minimized to an empty board with a few men left standing. The winner is when one of the player's kings is captured. Compared to Chess, Go is a total technical paradox. A typical Go game starts with an empty board and usually ends with a full board with the occupation of pieces by both sides with some exchanges of pieces for the control of selective territory. What makes Go more distinguishable from Chess is that all of the pieces possess equal importance. Someone told me that comparing the technicalities of Go to that of Chess is like comparing philosophies of two different cultures - Asian and Western. This quote from Descartes describes an aspect of the Western culture and the game of Chess: "I think, therefore I am." Where the quote "We think therefore I am…" illustrates a basic of Asian culture and the game of Go. The success of a winning Go game is when all of the pieces can work together, whereas in the game of Chess an uncertain number of pieces are usually sacrificed for the single aim of victory. A quote from Trevanian's book, Shibumi, is a good representation of the metaphorical difference between Go and Chess: "Go appeals to the philosopher in any man and Chess to the merchant in him." If you are interested in pursuing this game, you can check out the web sites of American Go Association (www.usgo.org) and the United States Go Organization (www.usgo.org). You can also learn Go by playing it online at http://games.yahoo.com/ (http://games.yahoo.com/), www.zone.com/go (http://www.zone.com/go), http://nngs.cosmic.org/ (or No Name Go Server, http://nngs.cosmic.org/). For those who wish to play Go on their desktop PC, my favorite is Many Faces of Go from Ishi Games (www.ishigames.com.) One other interesting link is John Fairbairn's "Go in Ancient China" web site (www.cwi.nl/people/jansteen/go/history/china.html). Over the years the AGA has distributed thousands of copies of Karl Baker's wonderful introduction to the game, "The Way To Go," to anyone who requested it by mail. It is now available for electronic distribution. You can download the file from AGA (http://www.usgo.org/usa/waytogo/), and print a copy on your printer. The layout for this version fits 8 1/2" x 11" paper. What the game of Go has taught a budding player is to think from a grand view. Do not take anything only at face value: Examine the possibilities. Test them if possible. Anything you do (practice, perform, and produce) is only as good as you are. To succeed in life as in the game of Go, one must start by occupying a strategic corner, then develop a strategic sphere of influence by focusing on continuous progress toward long-term strategic supremacy. If you want to learn a discipline that focuses on developing a strategic sphere of influence by forsaking short-term territorial gains and concentrating only on continuous progress toward long-term dominance, the game of Go may be the answer that you are seeking. It only takes less than an hour (nine minutes if you were a genius) to learn Go, but do you have a lifetime to master this game? M. E. Hom is a budding Go player whose goal is to achieve his 1st dan (first degree black belt in the game of Go) some day.